The bright wall paint color and the crib set are the foundation for our baby girl's pink and lime green nursery design. I find the combination to be very pleasing and exhilarating. The dark finish of the furniture balances the bold color scheme. By this I mean the dark furnishings grounds the space and keeps it from being too bright. 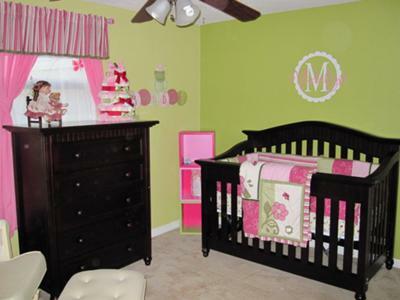 See more Pink and Lime Green Nursery Pictures in our photo gallery. Everything beyond the crib will transition well into her "big girl" room. The name of the baby bedding bedding collection that we chose for her room is from the Cocalo Angelica collection. Go here to see more fabrics and crib sets in lime green, pink and white to consider for your nursery decorating project. We bought the frog and butterfly print sheers and the pink tie back curtains and we made our own window valance out of the fabric of the baby's crib skirt. The stripe print of the valance fabric blends beautifully with the pink fabric of the solid pink curtain panels. The brand of the bright lime green paint color that I used was Glidden paint. I bought two shades off of the same paint sample strip in order to paint the walls using a two-toned painting technique. The wall shelves for our pink and lime green nursery were handmade and look fabulous in contrast with the bright green wall color. In my opinion the finishing touch that completed the look of our baby girl's nursery was the initial "M" wall decal over her bed. I love our baby girl's green and pink baby bedding and the wall color, but when I saw that single letter on the wall over the crib everything came together and it truly became HER room. Thanks for sharing your daughter's room with Unique Baby Gear Ideas, Stephanie! I love the colors that you used and wondered if you could please check to see if you might have the name of the Glidden paint that you used? I love the inclusion of lime green in this room although it made me wonder why it did not occur to me to use this shade of green in my daughter's room. It is too late for the nursery but I am definitely going to use it when it is time for a makeover. I like what you did with the room and the pink and green nursery color combination but am not so crazy about the bold shade of green. Everybody's taste is different! I make step stools that match this decor perfectly. They are painted white, pink and green with polka dots, a cute frog and a baby's footprints on top with the poem "I use this stool to reach things I couldn't and lots of things I shouldn't" that are personalized with the baby boy's or girl's name if anyone might be interested. Join in and write your own page! It's easy to do. How? Simply click here to return to PINK and GREEN NURSERY PICTURES and DECORATING IDEAS.